The SWR Drainage System is the result of Super’s pioneering research. It was the first such uPVC system in India which successfully replaced conventional CI and AC products. This system enables fast and efficient removal of waste without blockage and leakage. Its high impact strength, chemical and corrosion resistance, long life and virtually zero maintenance explain why it continues to be very preferred brand of architects and builders everywhere. In addition to various benefits this system is more cost effective than any conventional drainage system. High quality standards and wide range – Pipers are available in 75mm to 160mm and fittings are available in 40mm to 160mm. 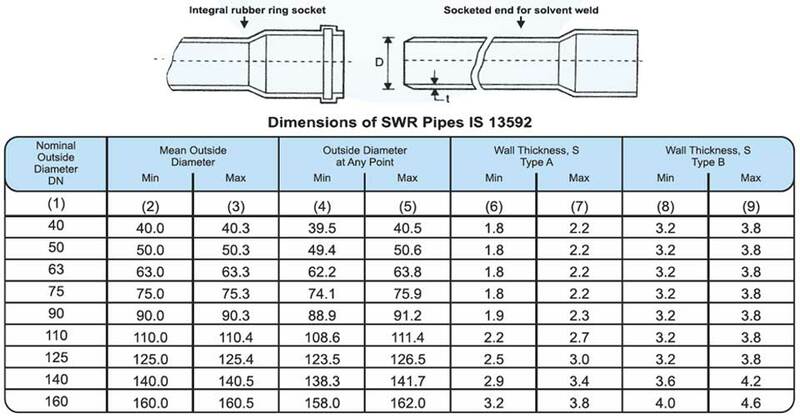 Pipes conforms to IS 13592 and fittings conforms to IS 14735 and are made to international standards. Unique click ring type fittings are the most suitable to be used in combination with Type B pipes for high-rise buildings. They system consists of pipes and wide range of fittings with various traps which makes the system complete in all respects and hence customer need not to depend on conventional system for any reason. Stronger and long lasting – This system is highly resilient, tough and durable with high tensile strength and high impact strength. Moreover it is free from problems caused by scale formation, rusting, weathering and chemical action and hence lasts for lifetime. Excellent chemical and corrosion resistance – Being non-metallic, this system is completely free from corrosion and offers very good resistance to wide range of chemicals.UV resistance – This system eliminates the adverse effect of sunlight and weather and can therefore be safely used for outdoor installations. Quick and convenient installation – System being extremely light in weight and provided with special rubber jointing technique, installation of this system becomes much easier. Quick and efficient removal of waste without leakage – Superior flow characteristics are ensured by the mirror smooth, restriction free inner surface of pipes and fittings, thus the system is free from problems of clogging and drain choke-up. System is completely leak-proof and designed re-maintain high standards of hygiene. Adequate and easy access for cleaning and clearing obstructions. Least maintenance – once installed “Super” S.W.R. drainage system works without any problem. Cost effective – Super S.W.R. drainage system is more cost effective than any conventional drainage system.